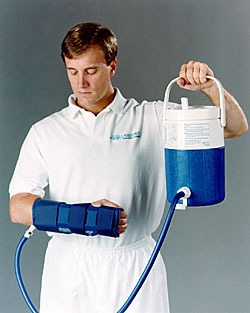 An insulated jug holds up to 4 liters of ice and water - enough for 8 hours of therapy. Elevating the cooler fills and pressurizes the cuff. Compression is controlled by gravity, and is proportional to the elevation of the cooler. For example, if the cooler is 20" above the cuff during filling, the applied compression will be approximately 35mm Hg (1" elevation = 1.8 mm Hg pressure). When body heat warms the water, it is rechilled simply by lowering the cooler. Back Cryo Cuff, Knee Cryo Cuff, and Calf Cryo Cuff. Cuff- covers the injured area. Cooler- holds enough water and ice for 6 to 8 hours of cryotherapy. Tube- exchanges the water between cooler and cuff.